Did life get in the way, moving your home goals down the priority list? If you’re looking for quick fixes that will add high impact to your home’s aesthetic, check out our budget-friendly interior design hacks room-by-room. Display clear glass jars filled with white fairy lights to add immediate warmth and character to a space. Leave the lids off so that the light can flow and disperse, mimicking the ambience of candlelight. 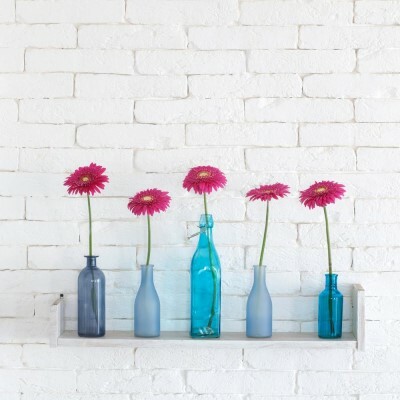 Hold onto a few extra jars (or glass bottles) as they make great little flower vases. Create a cosy and inviting atmosphere for you and your guests to enjoy. You can pick up a set of lounge pillows for less than $100—a rug will be about the same. The bedroom is where we sleep and relax, but it’s also where we wake up in the morning and get ourselves ready for the day. Aim for equal parts uplifting and relaxing. Eliminate unnecessary furniture and belongings. A crisp set of sheets and good quality bedding will also lay the foundation for a great new bedroom. There’s no better way to add comfort and style to a bedroom. A fluffy texture works great in winter, and you can swap it out for a white cotton throw as the weather warms up. Pot stands look chic while keeping indoor plants off the floor and away from pets. You can pick one up for under $50, and we absolutely love them both for practicality and aesthetic. Bathroom renovation? Sounds stressful. If you don’t have time or cash for a full makeover, have the best of both worlds by making minimal changes that will transform the whole space. There are no rules here—but if you’re after a quirky, bespoke look, opt for something bigger—even a kitchen-sized tap. Depending on the room and style, black or copper can work nicely, tying in all elements with a statement colour. Most bathrooms will have a mirror in place. If not—they’re an obvious must. Assuming you already have a mirror fitted, updating an old or tired looking mirror will really lift your bathroom’s spirits. A messy cook is a good cook—but an organised, messy cook is an even better one. Buying in bulk saves you money and shopping time, but the perks don’t end here! Bulk-shopping also gives you a great excuse to create your very own, customised jars, labelled with pretty chalkboard decals. No more scrambling for the bag of flour or sugar. Installing kitchen cabinets is a bit of a DIY stretch, but if you’re looking to up your kitchen game while creating bonus storage space, you can quite easily install open shelves that will serve the same purpose as kitchen cabinets. Not only will you fill unused wall space with extra storage, but open shelves are fresh and ultra-modern. The beauty of installing your own splashback? You have infinite design options. Select a material—glass, tile, mirror, wood or steel, and then select any colours, shapes, styles, patterns and textures you like. You can create something entirely unique. 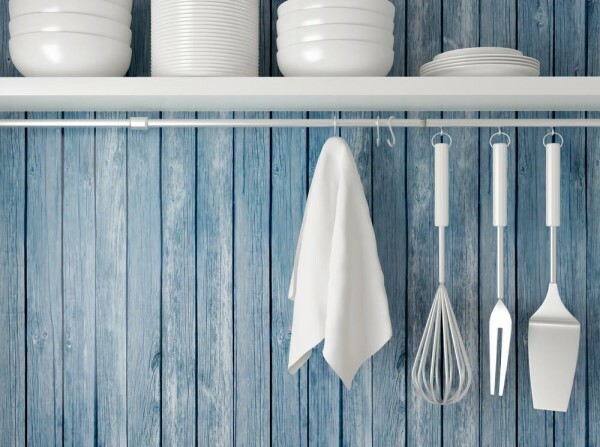 Add hooks just above your new splashback to hang pots, wooden spoons and other kitchen gadgets. Stylish and accessible — win-win. Surrounding yourself with nature, fresh air and good company is fantastic for your health. Make your yard the new hangout spot for family and friends with these simple DIY’s. Apply glow in the dark paint to your pots and then scatter them around your yard—this adds a lovely glow to the space without costing a cent in electricity. As the sunset fades, your scattered light source will not only be practical, lighting up walkways or seated areas, but will also create a gorgeous aura sure to impress. A fresh lick of paint on your front door can really brighten the entrance of your home, while also creating a sophisticated vibe. Dark greys or navy blues can work great, while others will prefer more vibrant options such as yellow or green.